Blackwax Boulevard 1 and 2, by Dmitri Jackson. 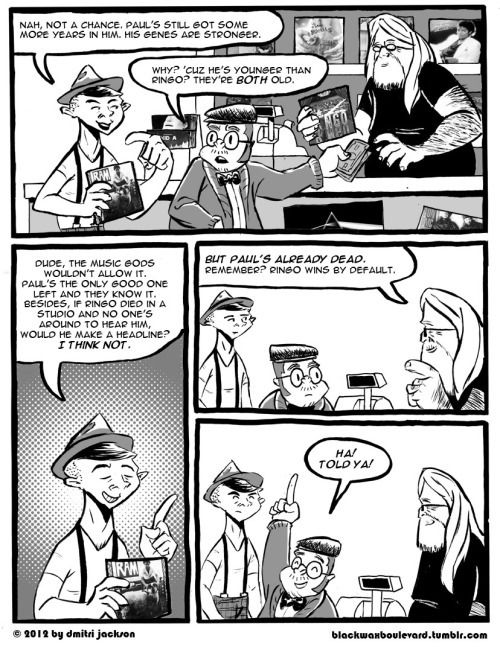 Originally and still currently a web series, these minis feature an incredibly sharply-defined set of characters who work at a dying indie record store. There's an obvious debt to Nick Hornby's High Fidelity here, but each member of the ensemble cast gets plenty of time and room to develop and prove that they're more than just one-note cartoons. 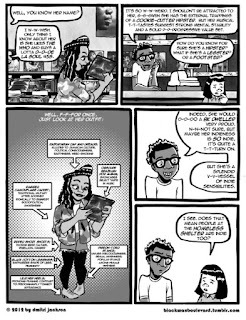 While young Marsalis "Mars" Parker is ostensibly the main character of the strip, in no way is he simply a mouthpiece for the cartoonist or established as the character who's always right. Set in a decaying city, Blackwax Boulevard (the name of the store) is doing everything it can to stay in business, including stocking mainstream pop that Marsalis finds repulsive. What Jackson does best is slowly generate stories out of character interactions; a woman Marsalis has a crush on turns out is going out with a glib street protester. We learn about the plight of the owner of the shop, who's lost a leg that he lost to diabetes replaced by an electric guitar. There are eccentric regulars and characters of various ages, genders and races. 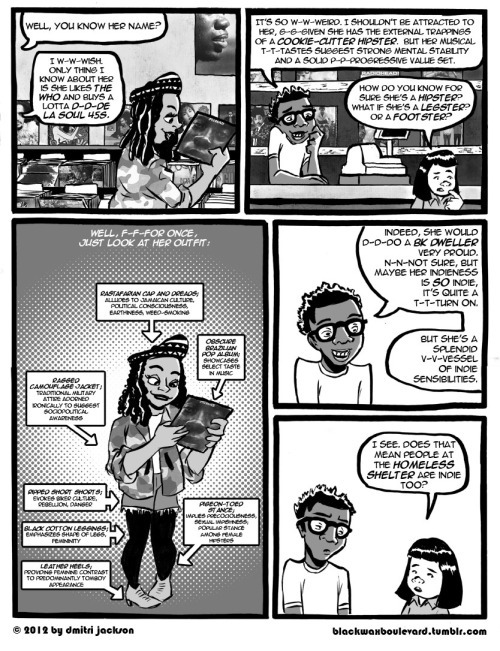 Race, gender, gentrification and other political issues are certainly addressed in this comic, but in a matter so organic that it never comes off as didactic. Jackson has an exaggerated, cartoony style that reminds me a bit of Kyle Baker by way of Ralph Bakshi. It's also clear that Jackson knows a lot about music, because the passionate arguments that various characters make come off as entirely authentic. 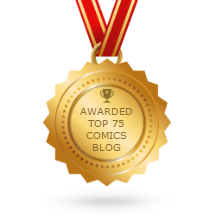 The pace of the comic is pleasantly rambling and episodic, as though Jackson is trying to find out about his characters at the same time the reader is, but he never drifts so far as to get self-indulgent the way that so many webcomics can. This is a comic that's certainly deserving of wider recognition. 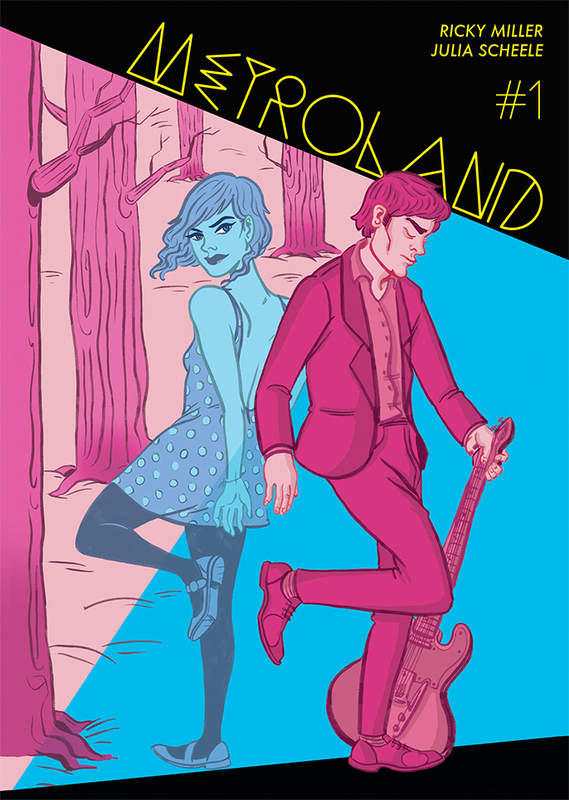 Metroland #1, by Ricky Miller & Julia Scheele. A rock 'n roll fairy tale is such an obvious mash-up that it's a wonder that it hasn't been attempted very often. Writer Ricky Miller credits the film Eddie and the Cruisers as an inspiration for his story of an alcoholic musician and the woman who took him on magical journeys through a window in a club called Metroland. The expressive character work of Scheele is an ideal match for this sort of dreamy story, especially with regard to the specifics of clothing as well as the muted pink and blue pastels that dominate the color scheme. While this is very much an introductory issue, the slow reveal of the series' more fantastic elements (the first hint being a modern-day poster on a wall advertising the new Beatles tour) turns this from simply a downbeat, slice-of-life story about being in a band into something else. 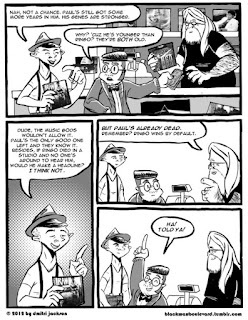 Certainly, this comic is very much about that as well, and the particulars of being in a local scene are sharply observed and drolly written, but the fantasy aspects of the series take the metaphor of becoming a part of a scene as a means of escape make this comic especially intriguing. I'll be interested in seeing just what happens in the fantasy escape world, how and why the mysterious avatar of escape (Jessica) comes to leave the band, and whether the plot becomes tighter or simply revolves around the past. I also quite enjoyed the "bonus tracks" in this comic: one a flashback to how the main character (Ricky Stardust) and Jessica came to meet, and another about future, obsessed fans of the band.